A little black cat has joined my family!! As of today, we don’t yet know his name, but the decision-making process has begun. He’s a boy, we know that much. And I’m guessing that he’s about 8 weeks old. I’m crazy about him!!! Though I adore him now, my first reaction to the thought of a new pet was – NO! I’ve been down this road before. It’s full of fluffy good times for sure, but I don’t need my crystal ball to see couch clawing, vase toppling, wire chewing and bad cat attitude in my future. Of course I took him anyway. Not that there wasn’t a certain amount of pressure …. starting with the psychic community. When I first met the kitty, I was just about to go on air with Psychic Friends Live. He was floating around in my head and I, perhaps idiotically, mentioned to Storm and the audience that I was thinking of taking in a little cat I just met. As you can imagine, if you ask a chatroom full of psychics whether or not you should adopt a black kitten, you get a resounding YES! And my friend and cohost Storm was the worst of the lot. All afternoon there were messages left. ‘Take the cat.” “Have you taken the cat yet.” ‘That cat better be in your house by now.” “Why aren’t you answering the phone – you better be out getting the cat.” He was relentless. But it wasn’t only Storm, our listeners and my friends who were encouraging me to take the little guy. My Tarot deck got into the act too. So that was that. And now I have a little familiar who’s waiting for his name. Sweet sweet sweet. I’m glad I took the cat. 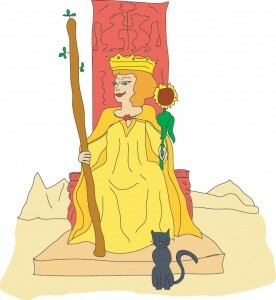 You are currently reading The Queen's Cat at The Tarot Room.